When I was first married I collected and traded recipes with everyone I knew. Each time I was given a recipe I would neatly write it on an index card and file it in my recipe box. As time went by, and with quite a few moves, my recipe box was packed away and forgotten. But with our recent move I rediscovered all these recipes and starting making them again. This Oatmeal Lemon Bar recipe is one of those recipes. I can't remember who gave me this recipe, but I do know it's delicious. It's a little different than a regular Lemon Bar where you have a shortbread base, a lemon filling, with powdered sugar sprinkled on top. Yes, this lemon bar still has that wonderful sweet yet tangy lemon filling. But instead of a shortbread crust it has a bottom and top crust that's made with a mixture containing rolled oats, dried coconut, walnuts, all binded together with melted butter. Irresistible. The lemon filling gets its tart and tangy citrus flavor from using both the zest and the juice of fresh lemons. Choose lemons that are fragrant with bright yellow skins. They should be firm, plump, and heavy for their size. Try to avoid lemons that have blemishes, soft spots, green spots, or are hard and wrinkled. We do need to grate the outer skin of one lemon as this is where you find most of the lemon's wonderful tangy flavor. Before removing the outer rind (zest) make sure you wash the lemon thoroughly (soap and water is best). I like to remove the yellow skin (zest) using either a box grater or microplane. Do not grate the white membrane (pith) just under the yellow skin as it's very bitter. The lemon filling also contains sweetened condensed milk which is a concentrated sugar syrup. It is made from a mixture of whole milk and sugar that has had about 60 percent of its water removed. Its consistency is thick and sticky (like honey) and it is very sweet tasting. The perfect complement to the sweet and crumbly crust. 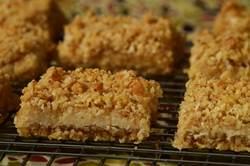 Oatmeal Lemon Bars: Preheat your oven to 350 degrees F (180 degrees C) and place the oven rack in the center of the oven. Line the bottom and sides of a 9 inch (23 cm) square baking pan with aluminum foil. Then butter, or spray the foil with a non stick vegetable spray. In your food processor place the rolled oats, flour, baking powder, salt, dried coconut, brown sugar, and chopped walnuts and process until combined and the nuts are finely ground. Add the melted and cooled butter, along with the vanilla extract, and process until you have a crumbly mixture. Evenly press about half of the crumb mixture onto the bottom of your prepared pan. Lemon Filling: Place the sweetened condensed milk in a medium size bowl. Whisk in the lemon zest and juice until combined. Pour the filling over the crust and then sprinkle the filling with the remaining crumb mixture. Bake for about 25 - 30 minutes, or until lightly browned. Remove from oven and place on a wire rack to cool completely. To Serve: Lift the Oatmeal Lemon Bars from the pan by holding the edges of the foil. Place on a cutting board. Peel back the foil and with a sharp knife and cut into squares. The bars can be covered and stored in the refrigerator for about 4-5 days. They can be frozen. TIP: Always remove the lemon zest first before halving and squeezing the lemon. Use a fine strainer to remove the seeds and pulp from the juice.